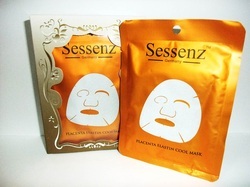 Series of facial masks at affordable rates. Mass wholesale & distribution available. 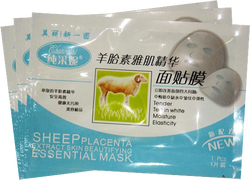 This whitening essence mask inhibits the formulation of melanin, prevents and helps to lighten dark spots and balance uneven skin colors. It's moisturizing properties lock its moisture within the skin and allow our skin to absorb its nutrition thoroughly, leaving skin smooth, bright and clear. 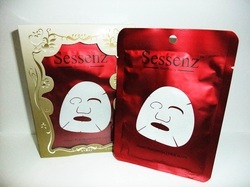 This deep moisturizing mask contain rich botanical extracts which easily penetrate and lock its essence into dermis for moisture replenishment and cell regeneration. It immediately provides intensified hydration for vibrant, soft and silky skin while improving skin elasticity and firmness. 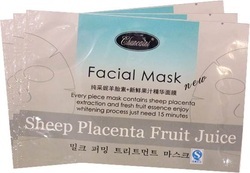 This specially formulated Mask helps to regulate the sebum secretion and deeply cleanse the pores & promote the skin clarity while its anti-wrinkle and moisturizing properties work on the skin, leaving it smooth and revitalized. Deionized Water, Zea Mays (COM) Extract, EGF, Acetyl Hexapeptide_8, Hyaluronic Acid, Yeast Extract, Amino Acid, Isononyl Isononanoate, Melaleuca Alternifolia (Tea Tree) Leaf Oil. It's anti-wrinkles properties promote the activity of fibroblasts and improve protein synthesis to make the skin firm and lifted. It's moisturizing contents lock its moisture within the skin and form a protective barrier to protect the complexion, leaving the skin revived and refreshed. 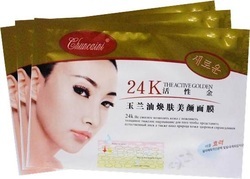 Deionized Water, Crithmum Maritimum Callus Culture Filtrate (Stem Cell), Collagen, Milk Protein Extract, Hyaluronic Acid, Sea Urchin Extract, Vitamin E, Licorice Extract. Using the latest technology with 3D earlobe design cutting, it allows end users to lobe it over the ears, without worrying the mask will fall off even you are walking around.